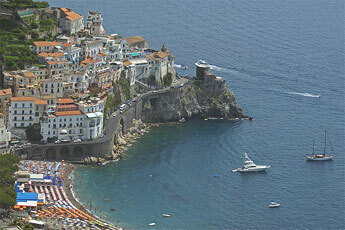 Amalfi has an ancient history, founded by the romans, was an independent republic from the seventh century until 1075. The Maritime Republic of Amalfi was one of the four great naval powers, together with Pisa, Genoa and Venice. You can see the history everywhere in town, the Cathedral with its magnificent bell tower dates back to the 13th century, the Cloister of Paradise, next to the cathedral, is home to old mosaics and paintings, and 120 columns built in the Arabic style. The Amalfi coast is famed for its production of Limoncello liqueur and home-made paper used throughout Italy for wedding invitations, visiting cards and elegant writing paper.